As the promoting season draws to an end, there is one chore that becomes dire—cleaning my office. In the fast-paced days that overrun with balancing checkbooks, shipping and delivering books, cooking, cleaning, laundry, signings and festivals . . . things get dumped. 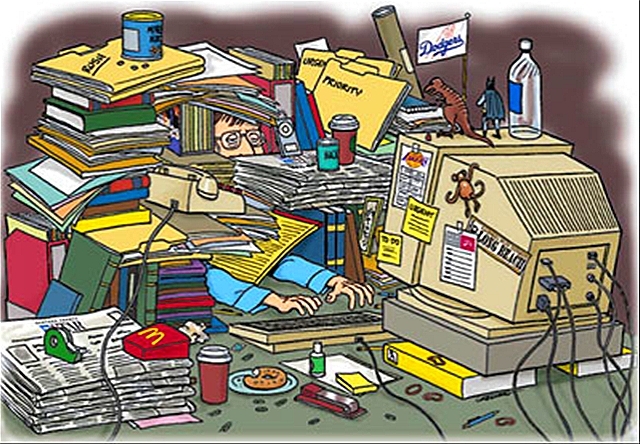 Piled here and there, stacked on every chair, thrown in baskets and tossed in bins, is the amassed substance that is the necessary evil of the writing business. For two weeks I have been tackling it bit-by-bit, shelf-by-shelf and drawer-by-drawer. I am making headway; I have a whole side finished. My office is a F.R.O.G. (finished room over garage), so it is pretty large. At the current time it houses nine bookcases (overflowing of course), three credenzas, two desks, a sofa, two ottomans, five side tables, a printer stand, three stacking storage bins, numerous file boxes with handles (some really nice designer ones from Target), two combo CD/Cassette players, a Delonghi portable radiator, a huge upholstered “editing” chair with matching footstool, triple pole lights, and side table. Six dinette style chairs are randomly scattered, close to the corners so I don’t trip over them, that I currently use as much needed flat space for storing works in progress, multiples file folders, and all manner of books to be read. So, it’s easy to get junked up. It starts junked up. But I am an organized person underneath all this and so I can only tolerate the chaos for short spurts. Next week I tackle my bulletin board, which is always a delight. It’s a little encapsulation of the year I’ve had and always has some special mementoes I rarely share. Stay tuned.